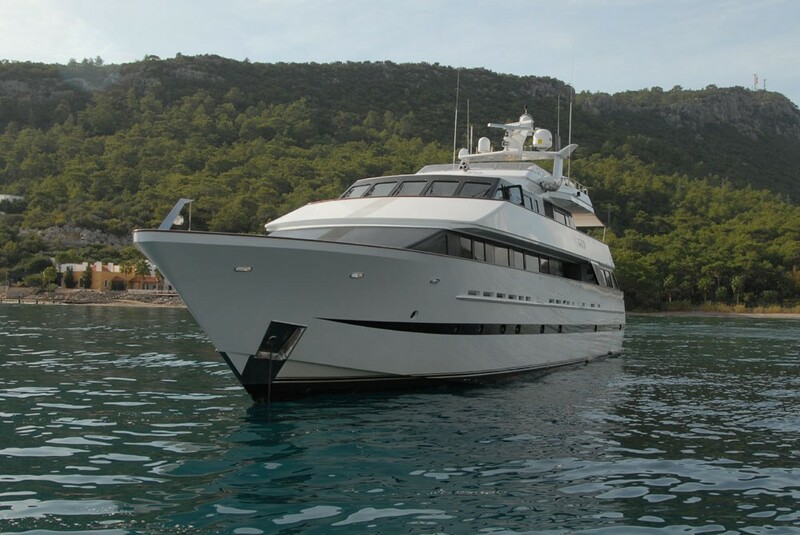 Motor yacht LADYSHIP is a 134' 7" (41m) yacht built by Heesen Yachts, Netherlands. 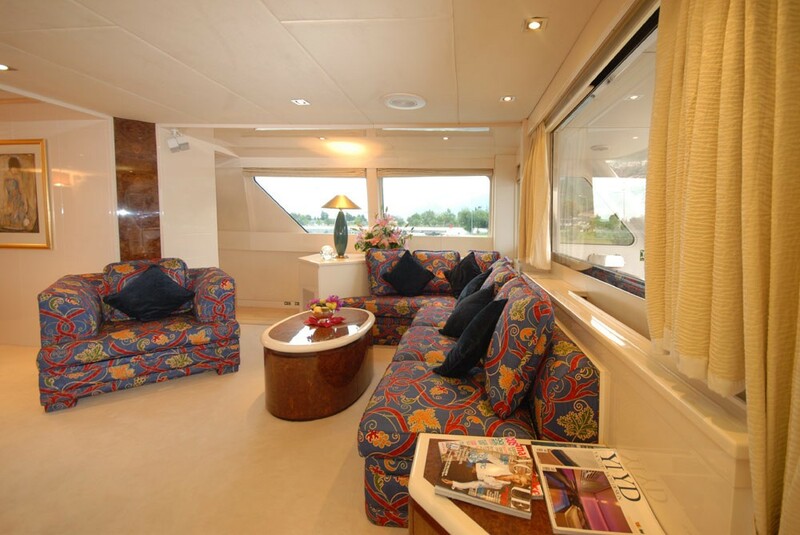 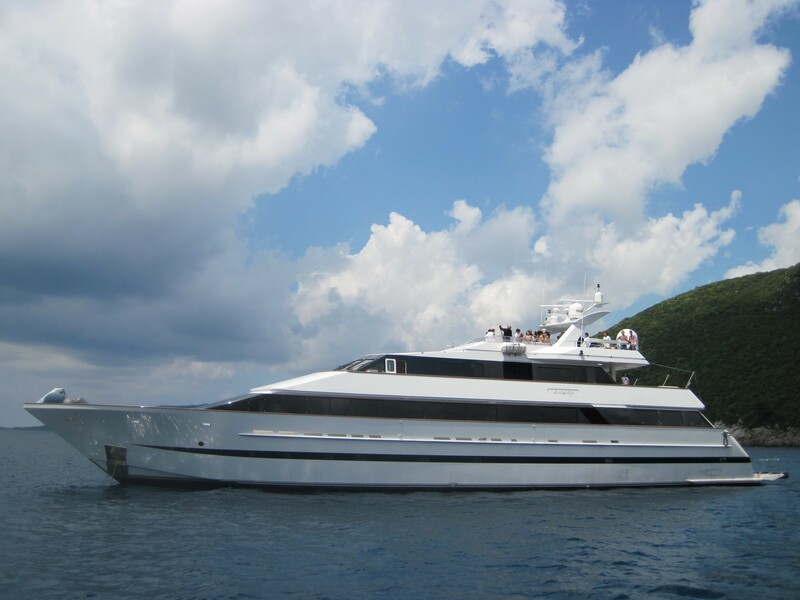 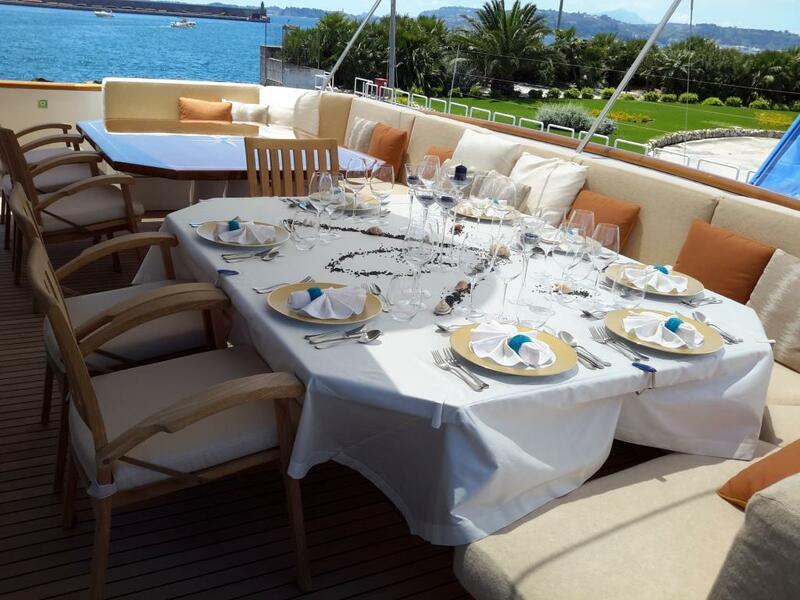 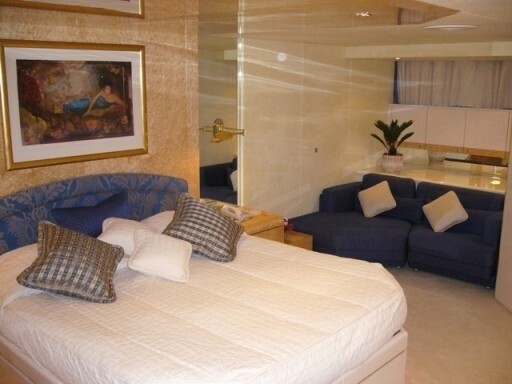 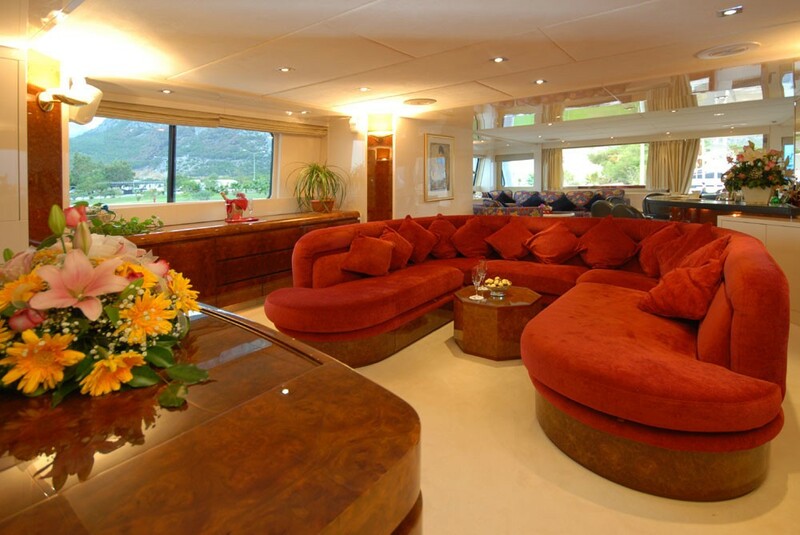 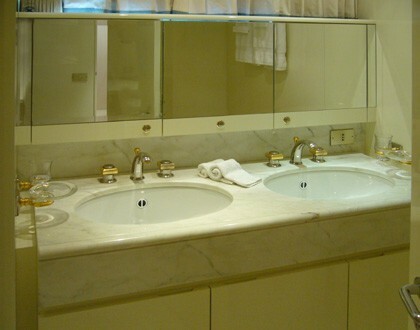 M/Y LADY SHIP was built in 1994 and has received several refits throughout the years including a refit in 2010. 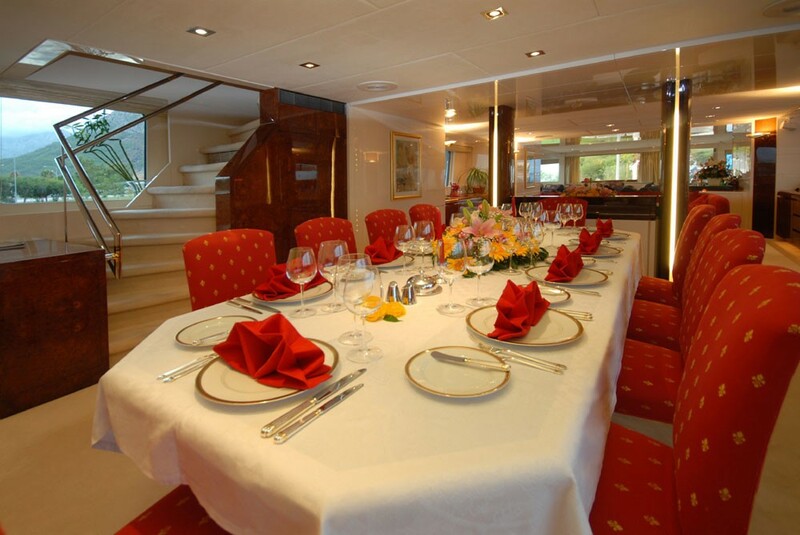 The Heesen motor yacht LADYSHIP is able to accommodate up to 12 guests offering excellent value for money. 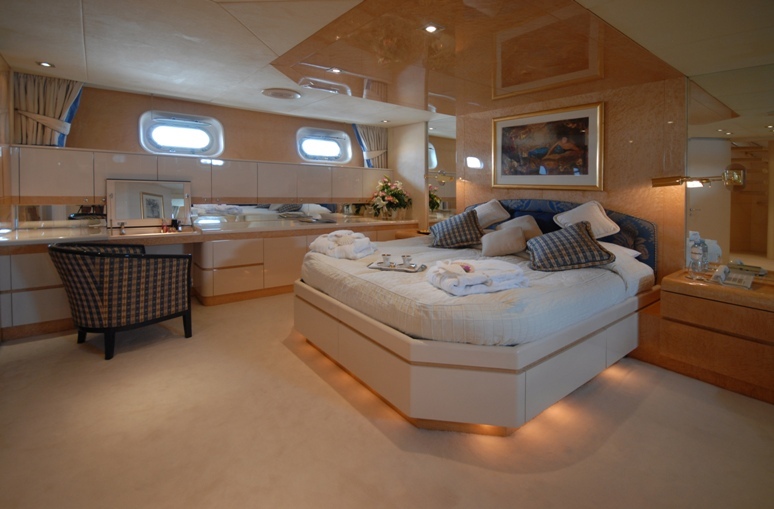 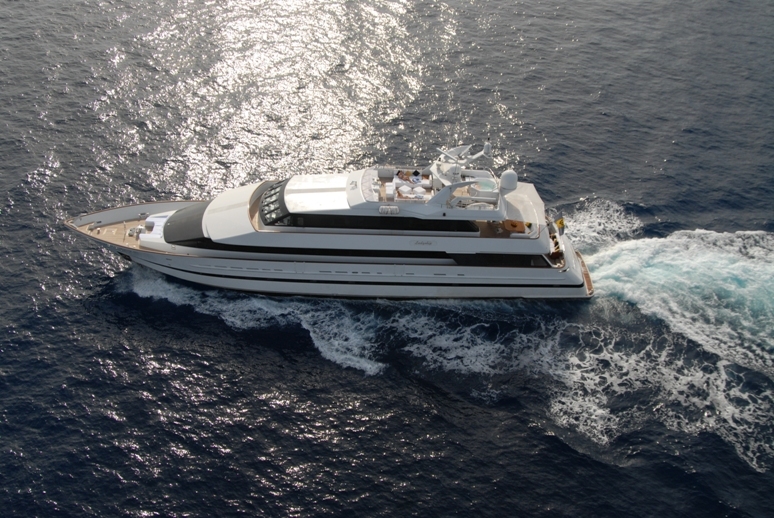 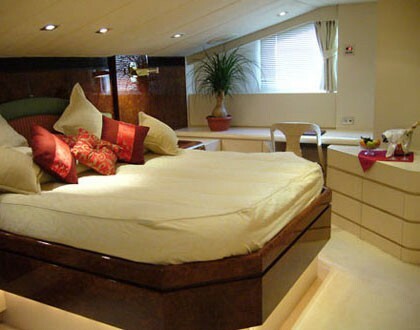 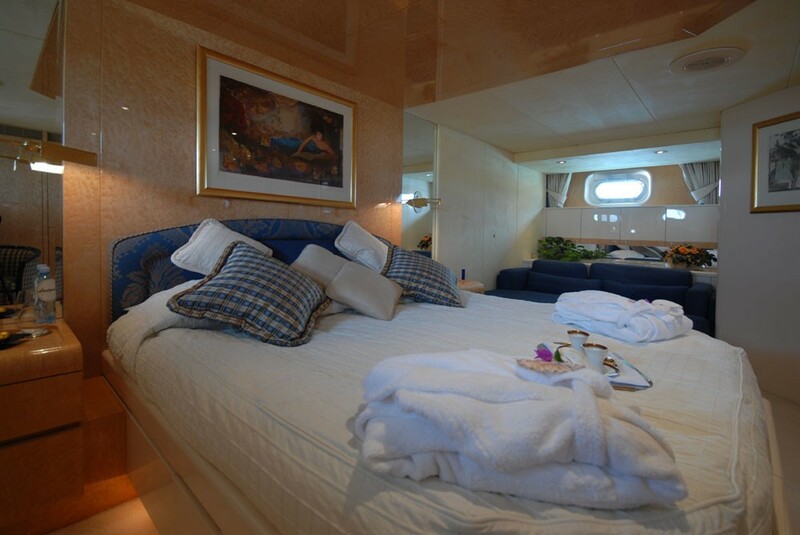 Motor yacht LADYSHIP is able to sleep up to 12 guests in 4 double and 2 twin bed cabins. 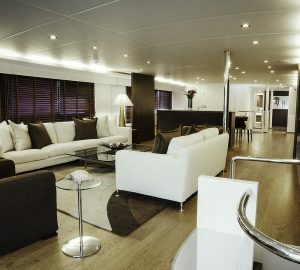 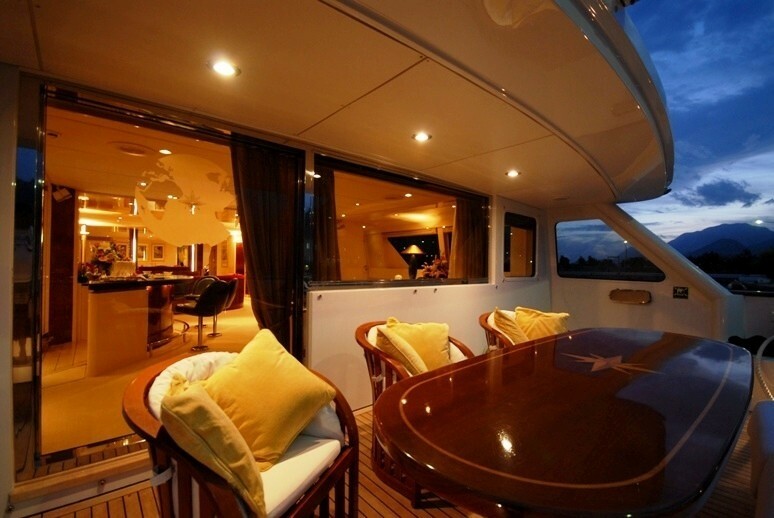 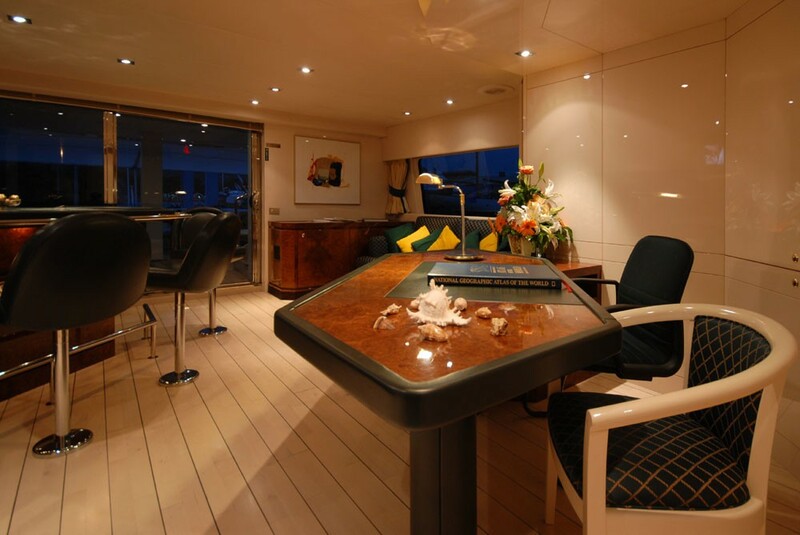 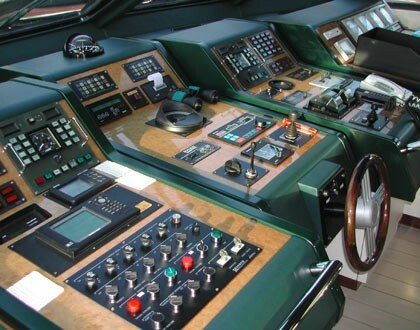 The Master cabin is located on the main deck. 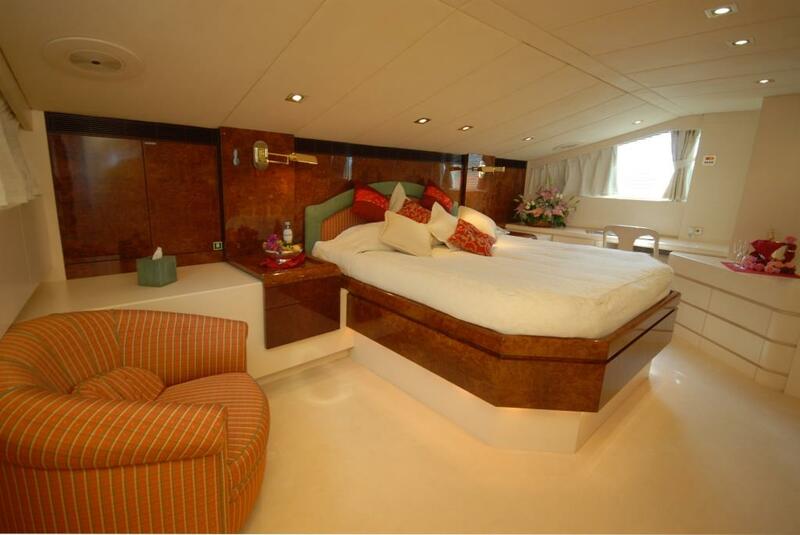 The two larger double and the two twin bed cabins are on the lower deck. 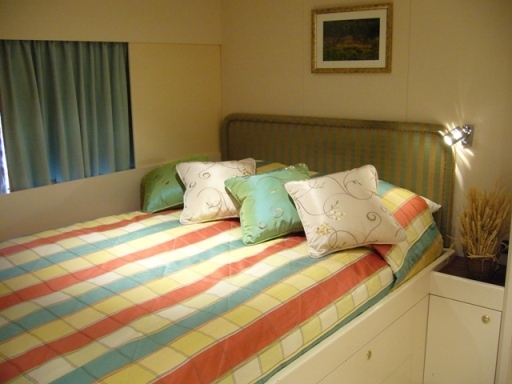 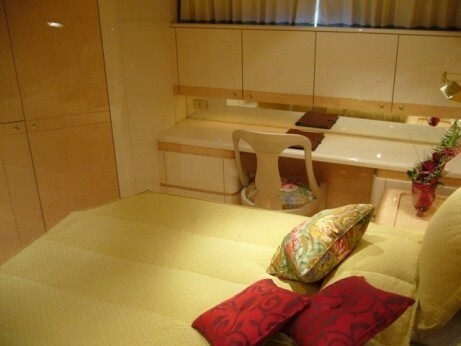 The cabin on the upper deck has a smaller double bed that is suitable for young adults or children. 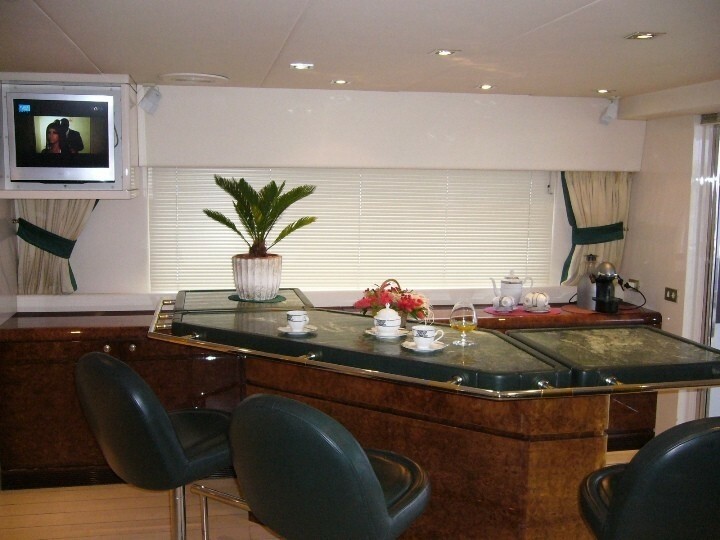 The cabins have Plasma or LCD Multi system TV, DVD and CD player and music center. 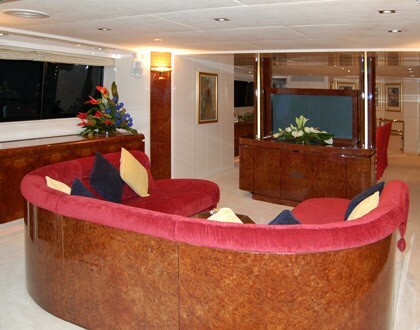 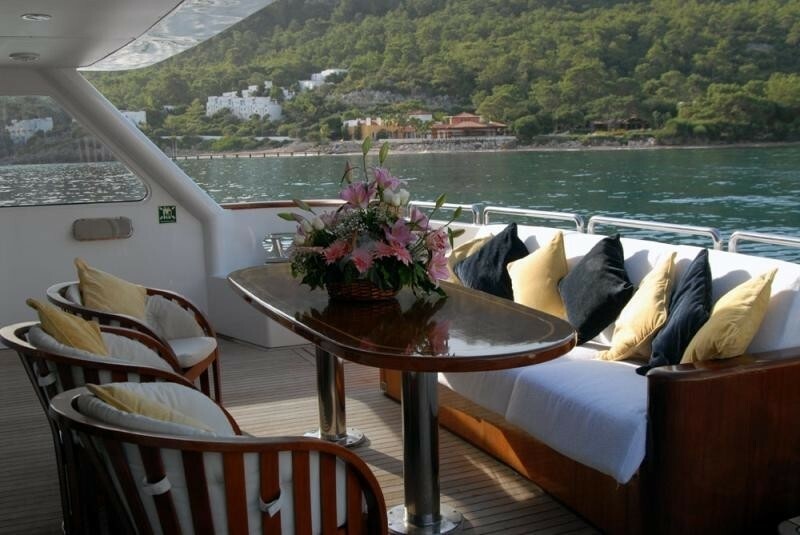 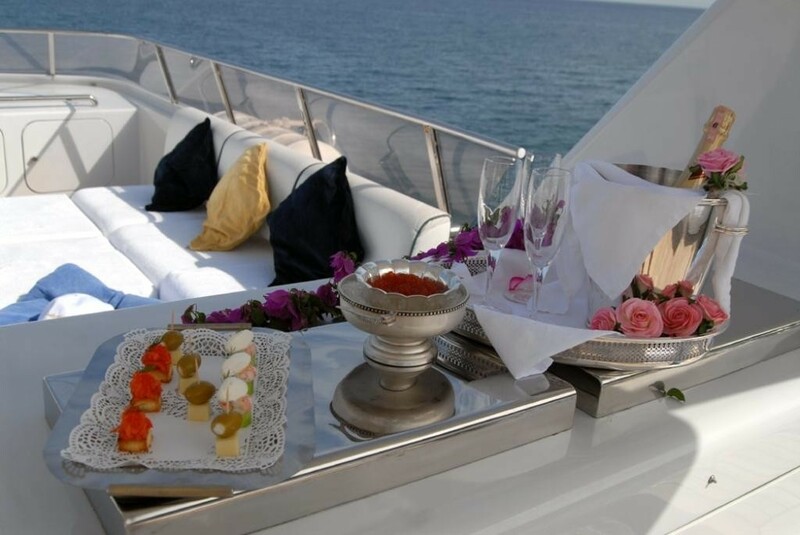 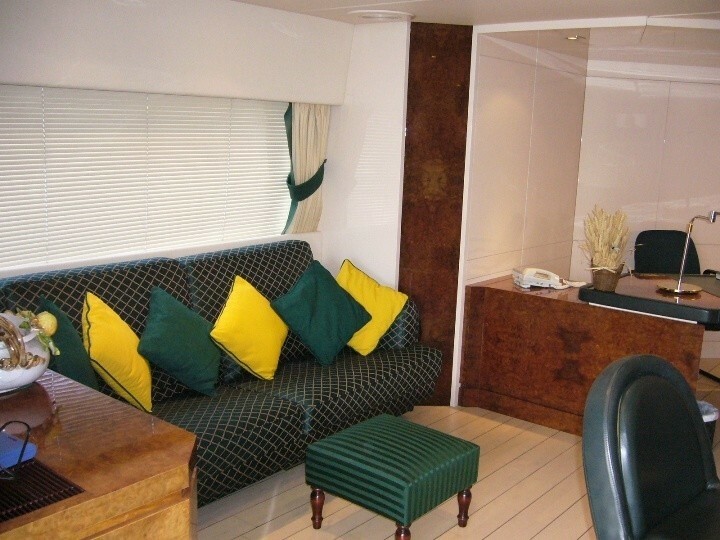 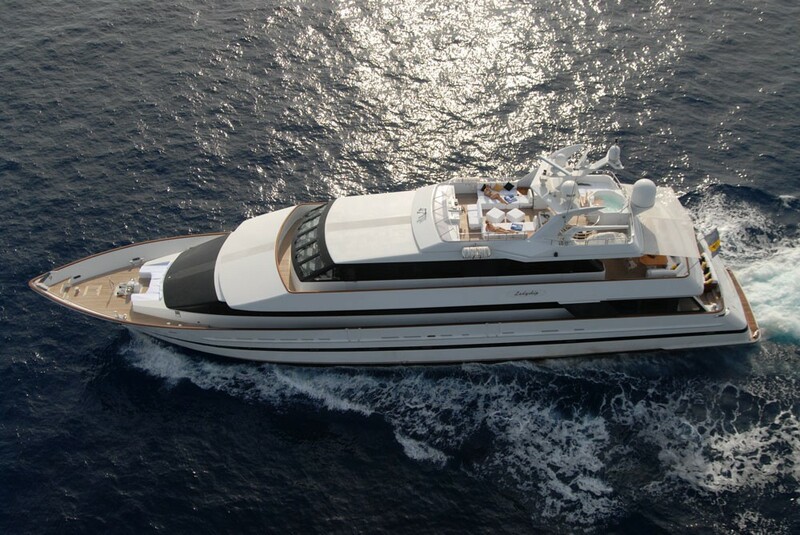 Outside, M/Y LADYSHIP has a spacious Top deck with plenty of sunbathing areas and a Spa Pool. 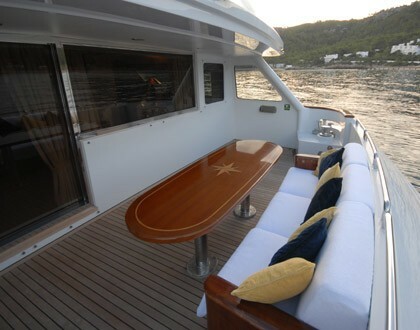 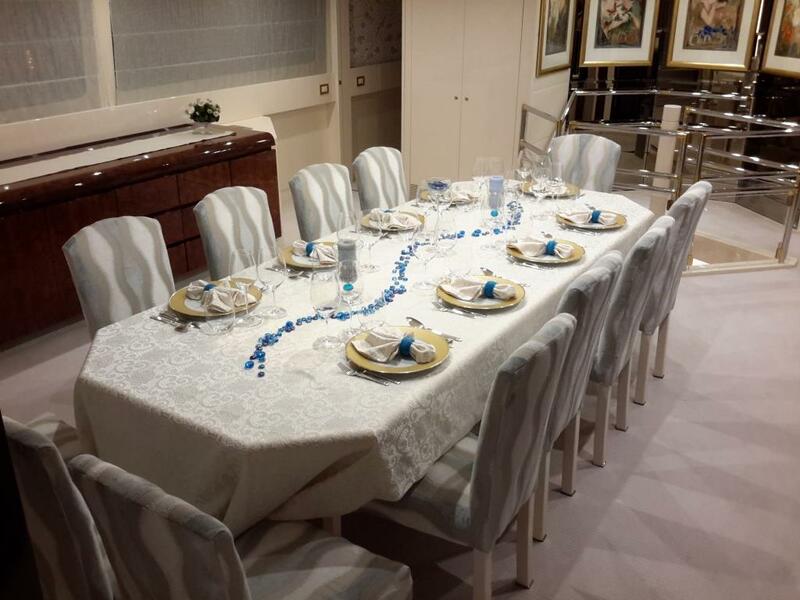 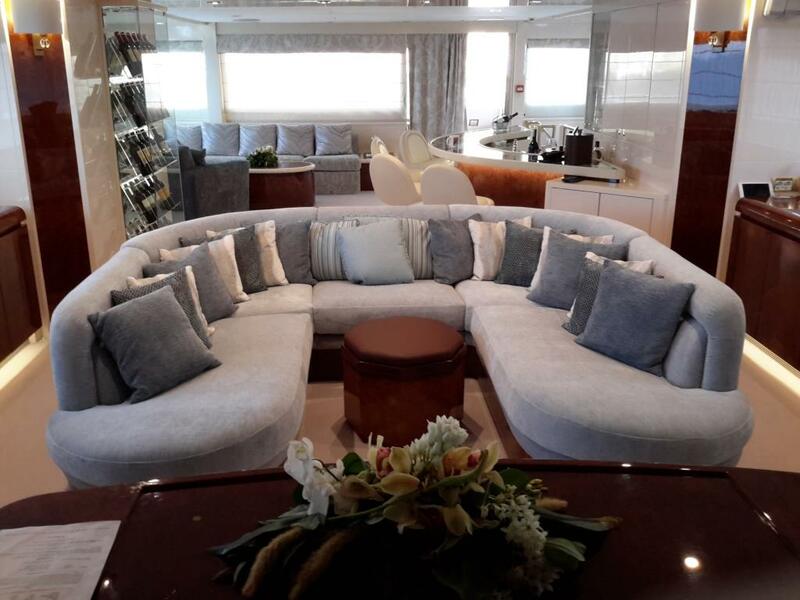 There are sofas and two tables for 12 guests on the upper deck and a smaller sofa and table for 6 guests on the main aft deck. 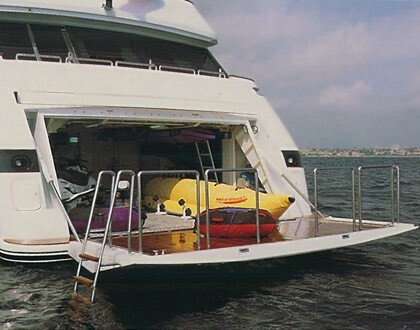 Her large swim platform opens out from the large garage that stores her many water sport toys. 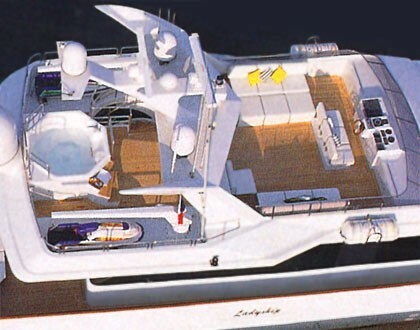 LADYSHIP was built and constantly maintained to ABS Class. 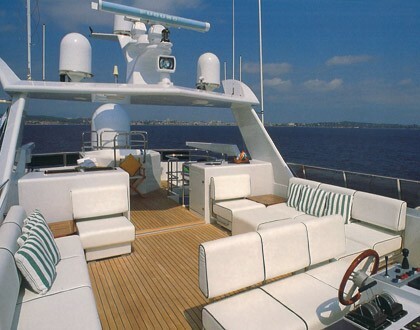 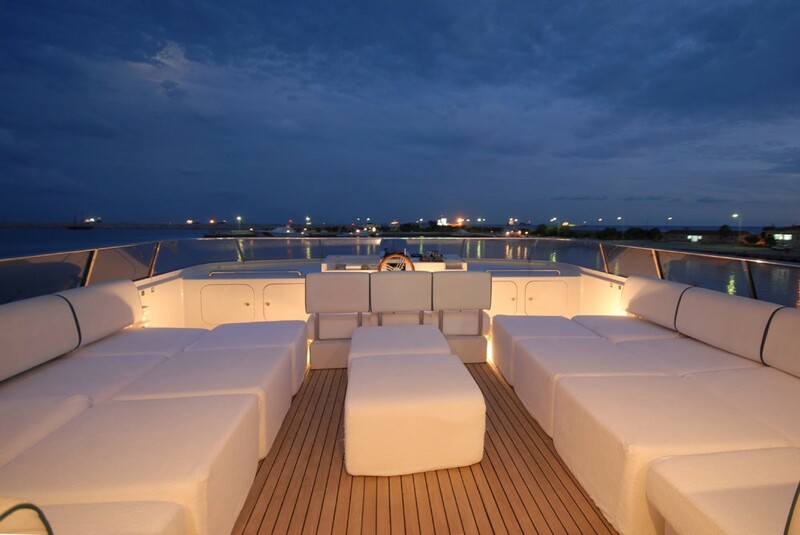 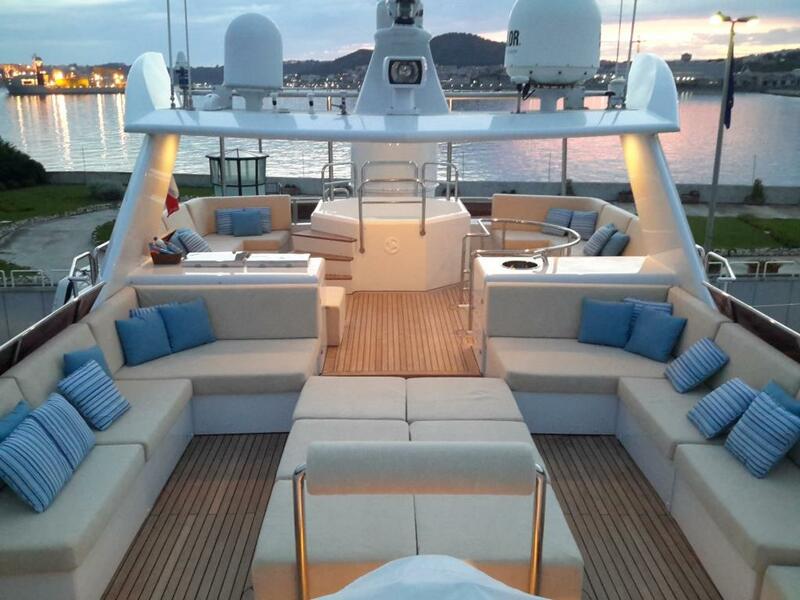 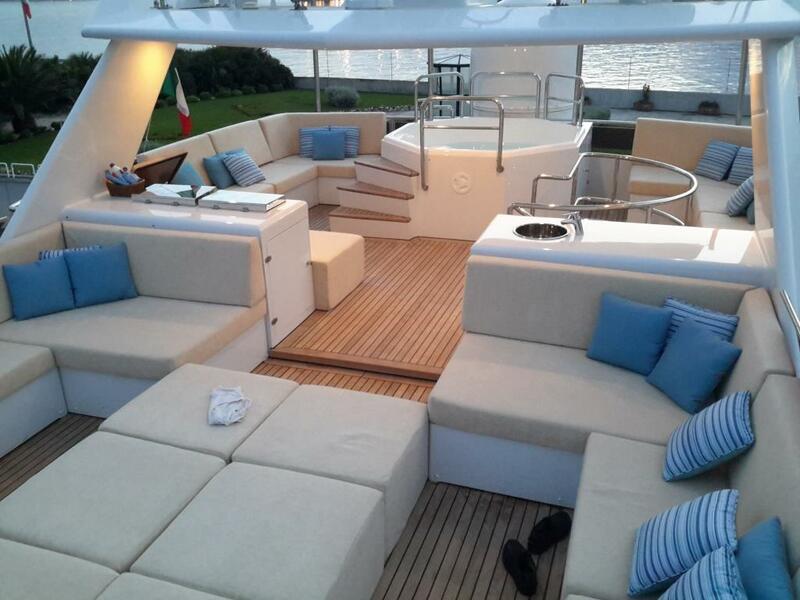 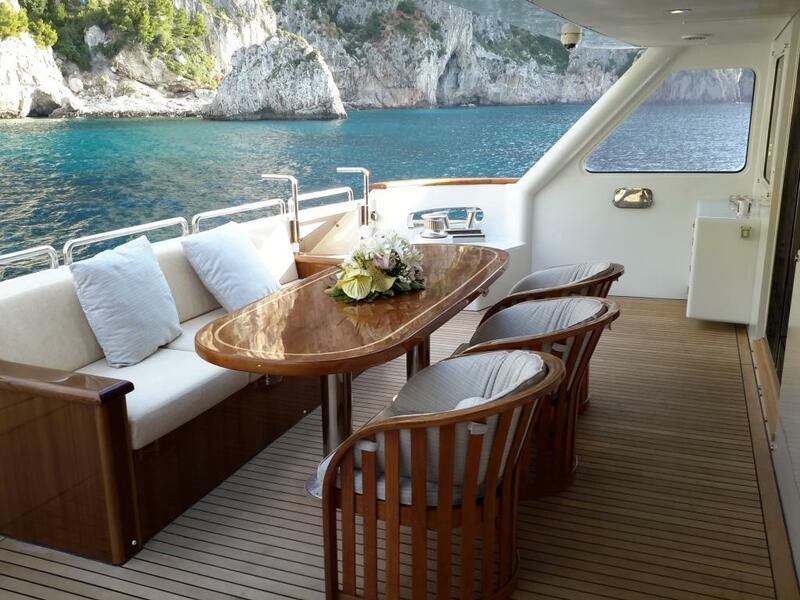 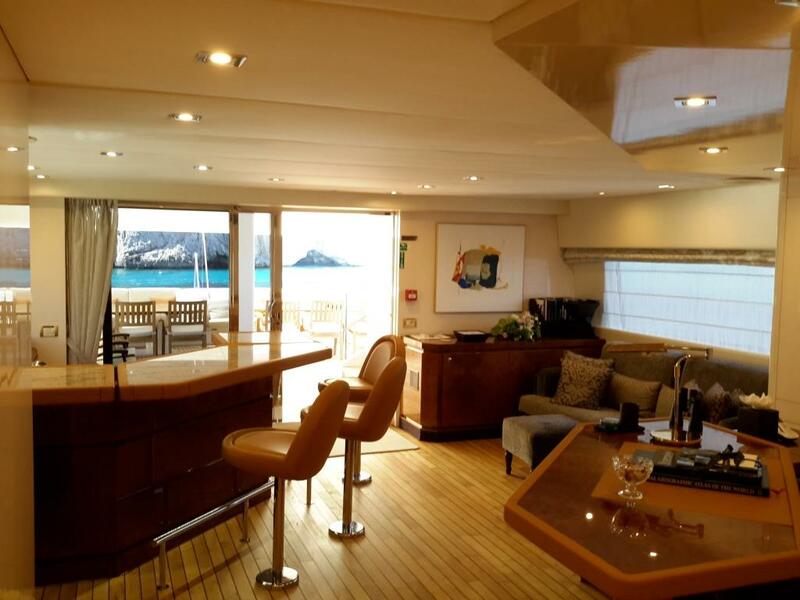 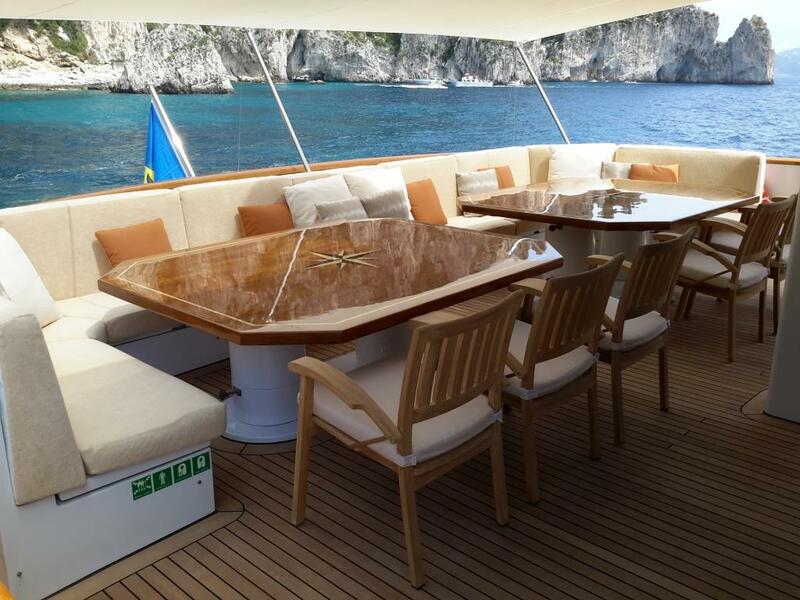 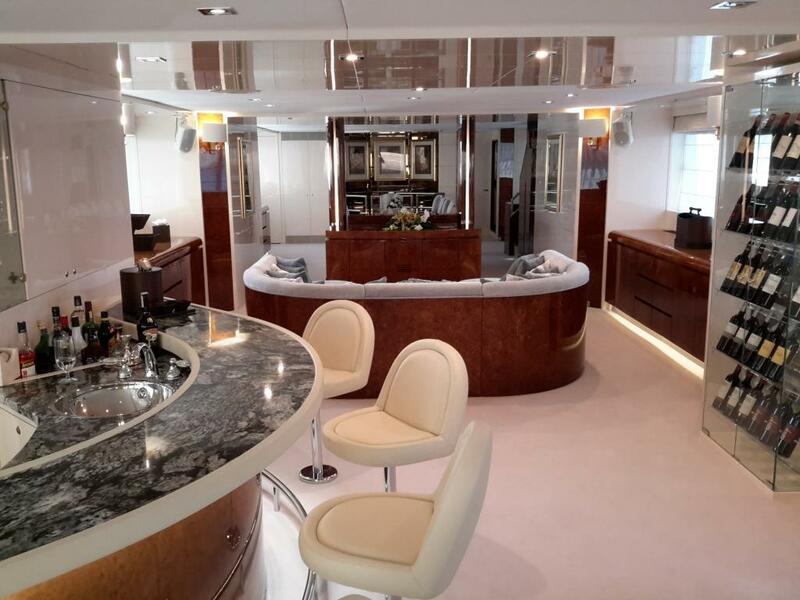 In the winter of 2009/10 motoryacht LADYSHIP received a complete change of teak deck on flybridge , new outside tables, new LCD television in main saloon, cosmetic works on the interior, such as changing fabrics, ceiling and wall panels. 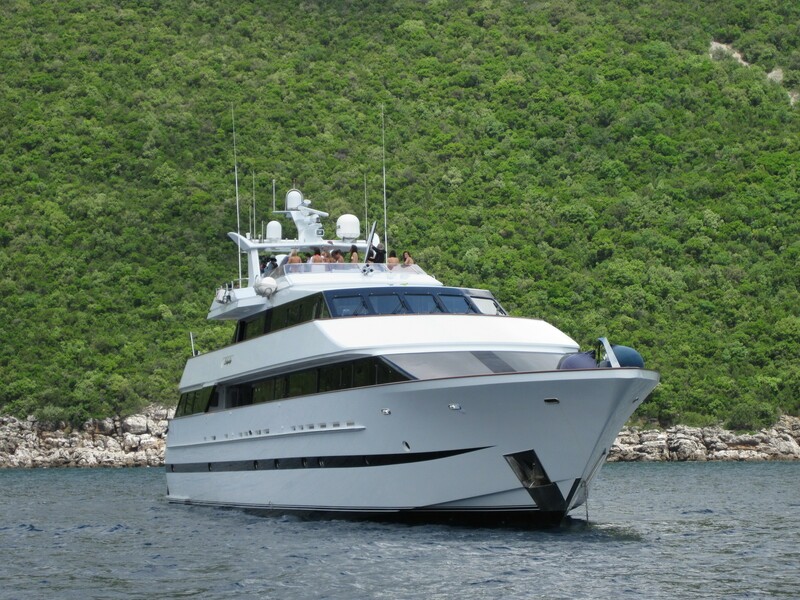 She also received an extensive refit and 15 year class survey in the winter of 08-09. 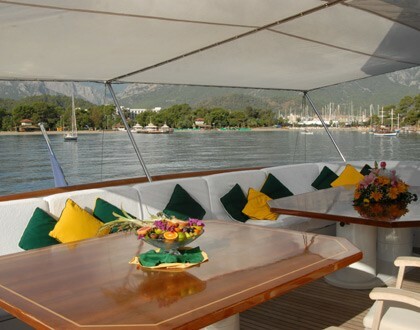 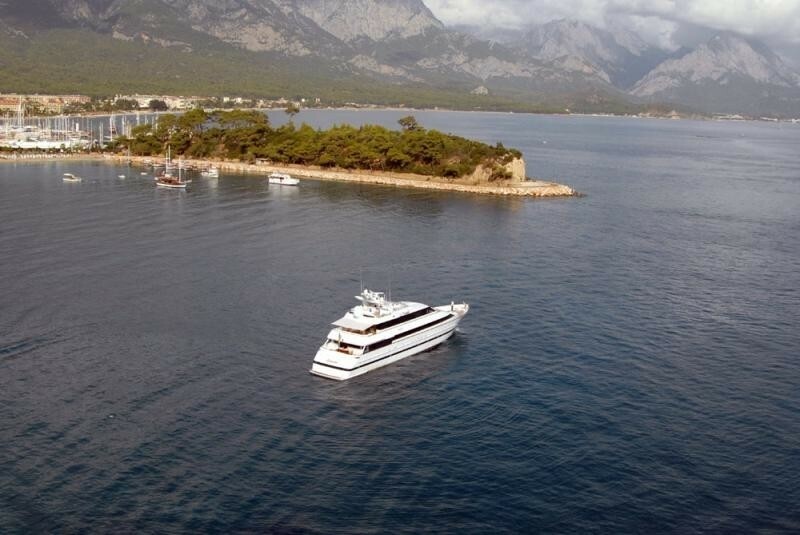 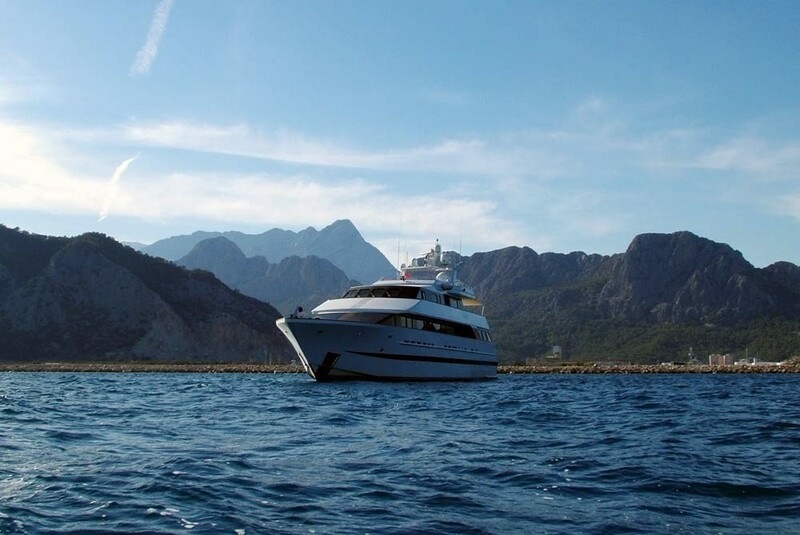 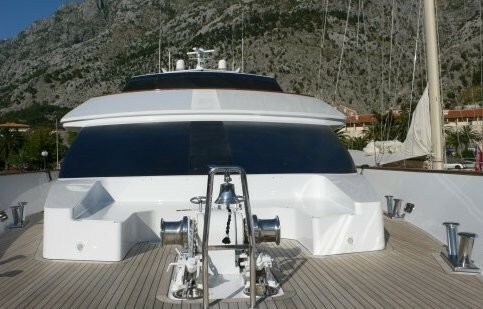 Motor yacht LADYSHIP is based in Montenegro and cruises in the Eastern Med. 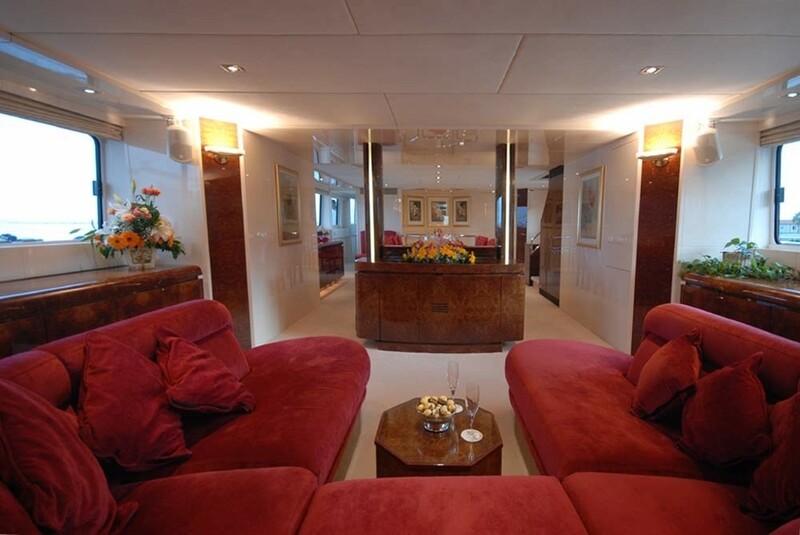 Heesen motor yacht LADYSHIP is able to accommodate up to 12 guests in 6 cabins. 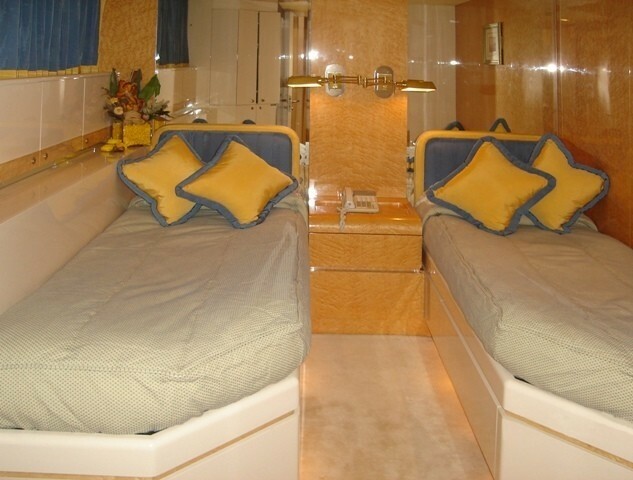 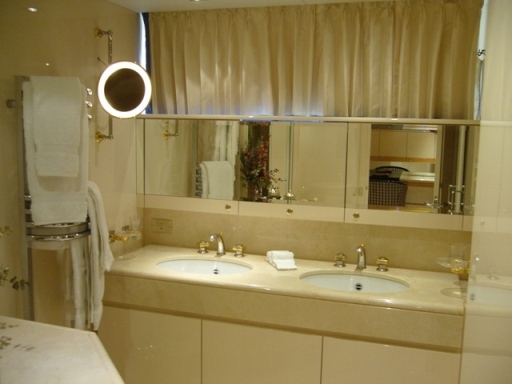 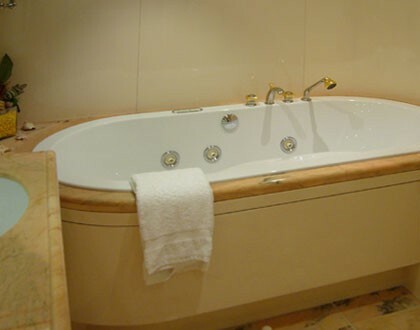 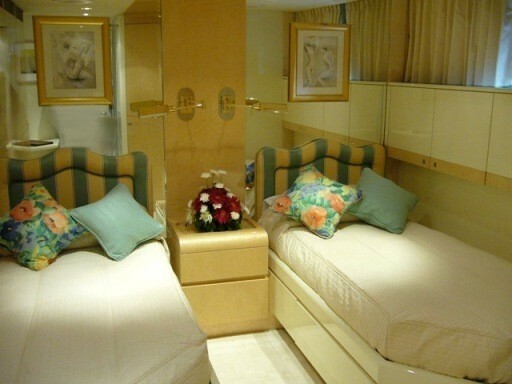 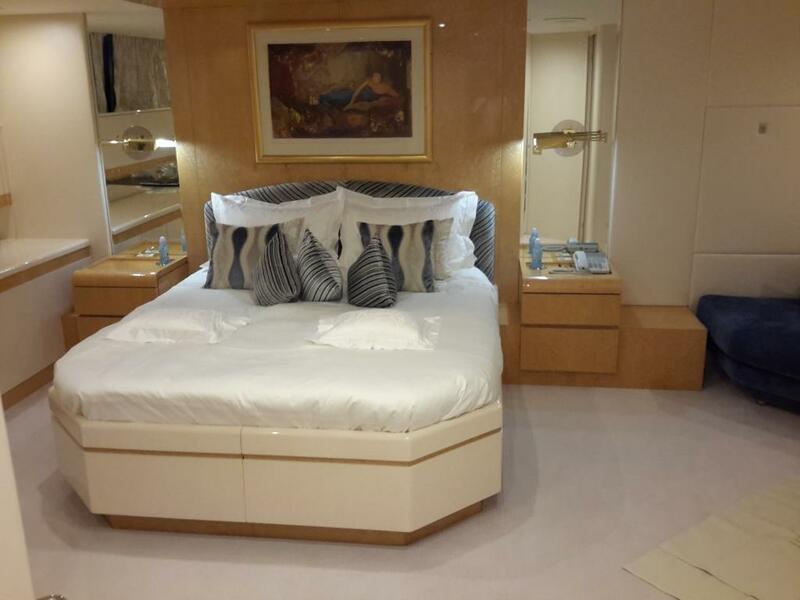 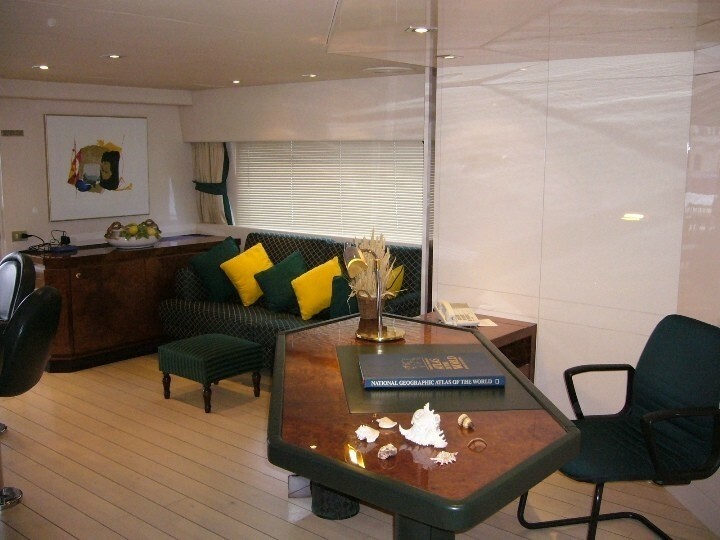 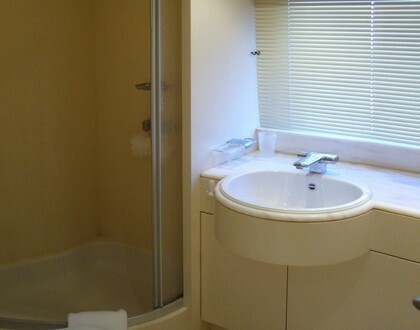 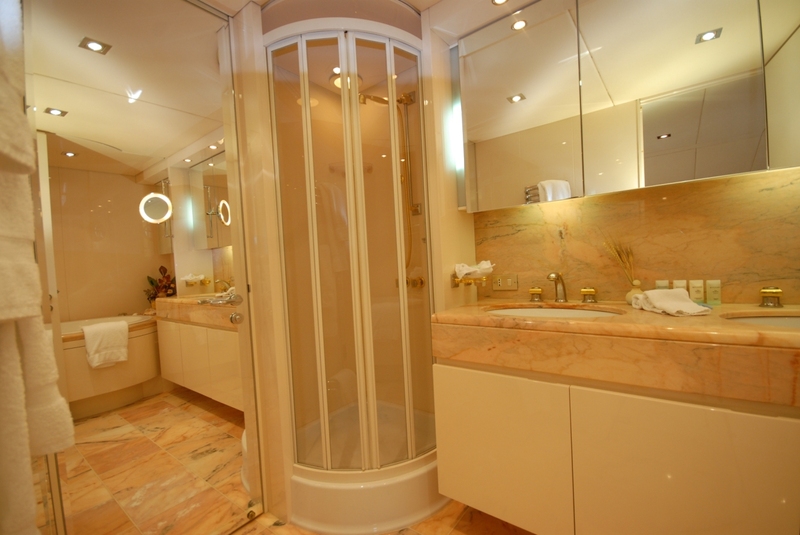 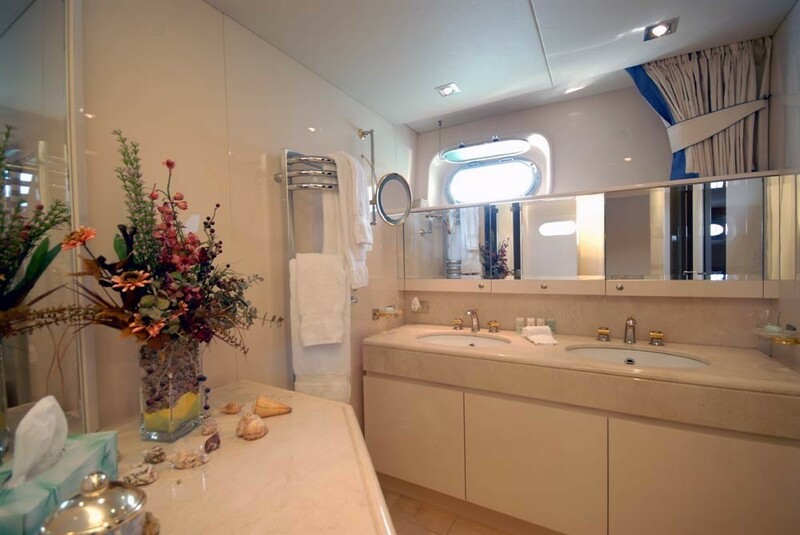 Her Master cabin located on the main deck, forward has a Spa Pool bathroom ensuite. 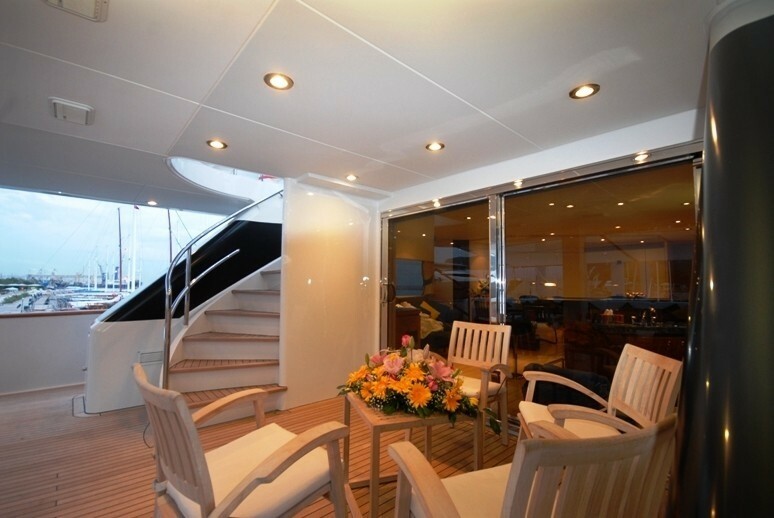 The day head is situated in the passage way leading to the master cabin. 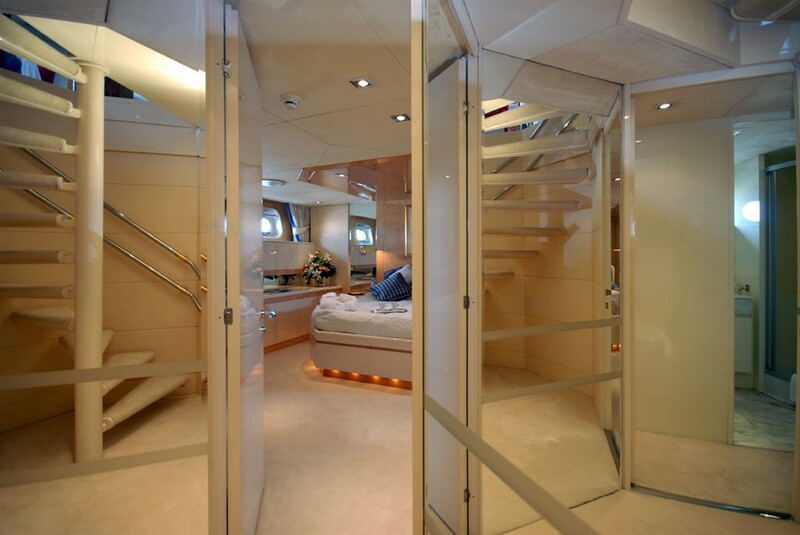 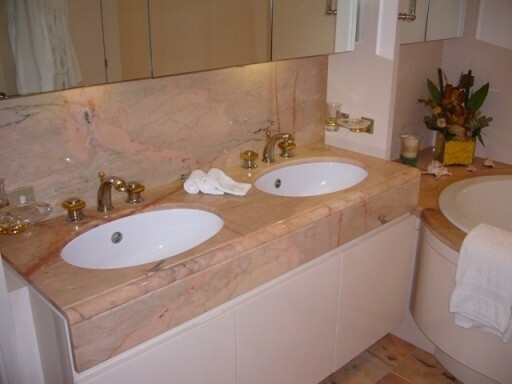 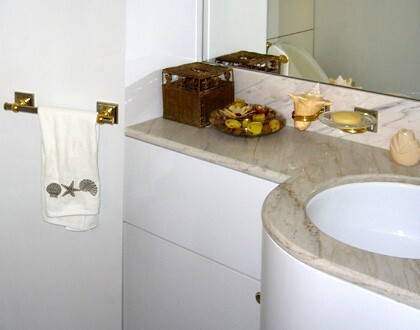 By closing the passage with a second door, the day head becomes part of the owner's suite. 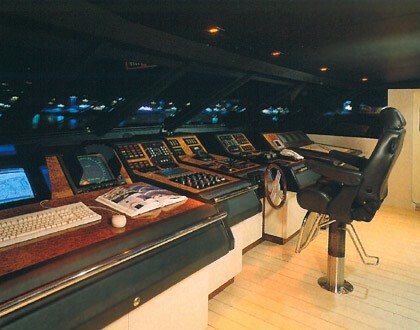 There is a second day head on the bridge deck with entrance from outdoors. 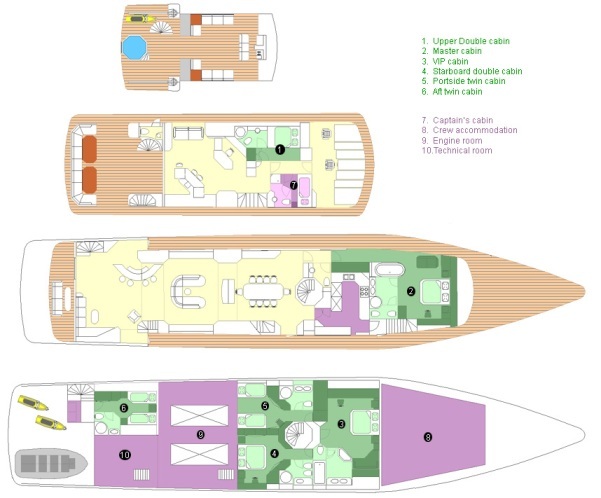 One the lower deck amidships there is a VIP cabin, for two guests plus one child, and a double cabin located amidships to starboard with a double bed and ensuite . 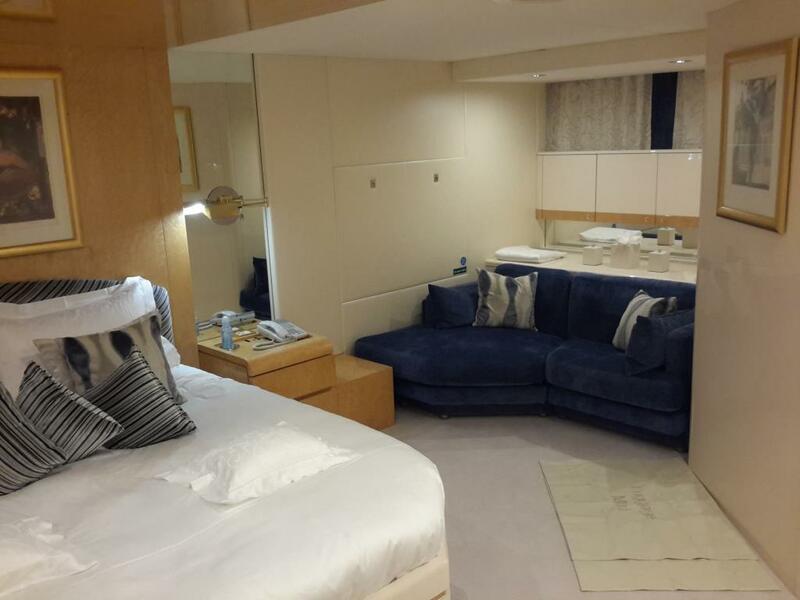 On the lower deck there is also 2 twin cabins each with shower room ensuite and finally, on the upper deck between the bridge and the sky lounge there is another double cabin with a bed suitable for 2 young adults, 2 children or 1 single adult. 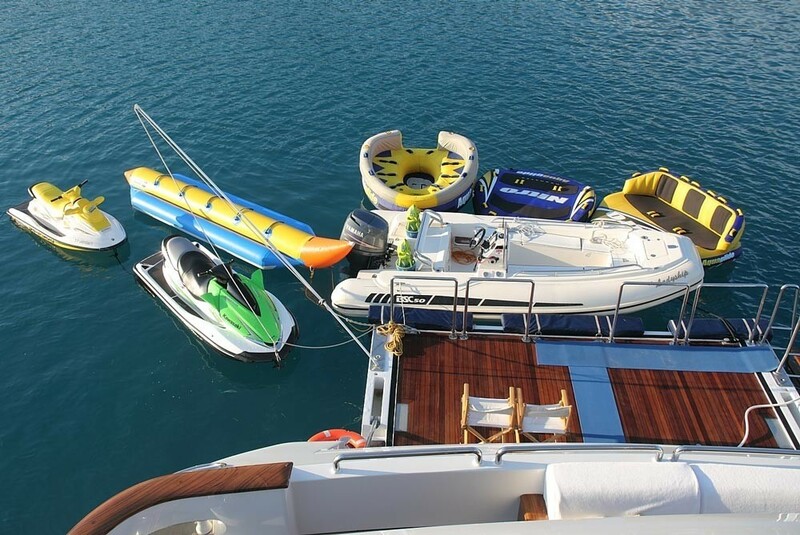 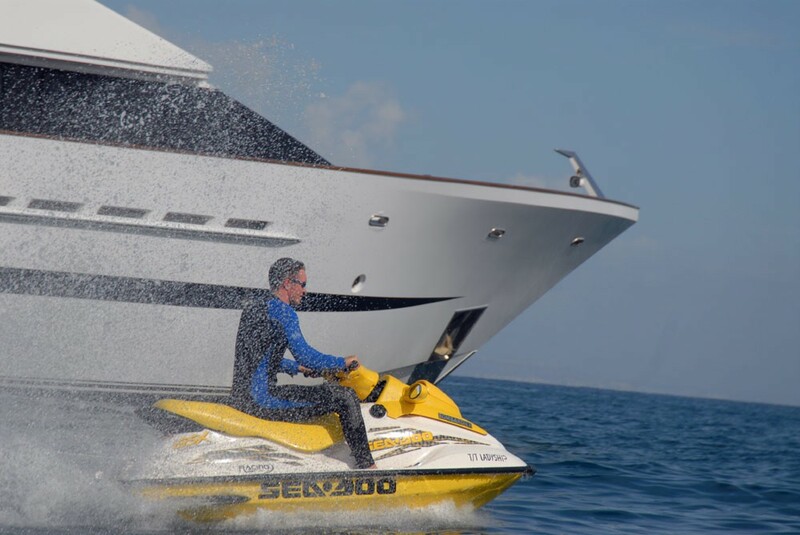 Motor yacht LADYSHIP has a great range of extras including the following tenders and toys: ABSC 5 m RIB with 80 hp Yamaha (new June 2009), a Zodiak 3,5 hp (Cadet - Mercury), a Kawasaki ultra 250, 4 stroke, 250 hp (new June 2009), a GSX Seadoo Bombardier 2003 model with 110 hp, a Kawasaki jetski model 750SX with 80 hp, a Kayak (Hobie-Odyssey 2) plastic/hard body capacity for 2 adults and 1 child, am Aquaglide Retro for 3 persons, an Aquaglide Nitro for 4 persons, a GT6 Skitube, a Waterski, an Inflatable Banana, an Inflatable Skibob, and Snorkelling and Fishing equipment. 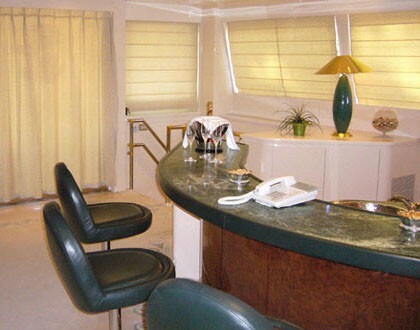 Communications include Sea-Tel Satellite Television Receiver, Full Communications equipment: Satcom M and Mini-M (phone/fax); Cellular phone and e-mail. 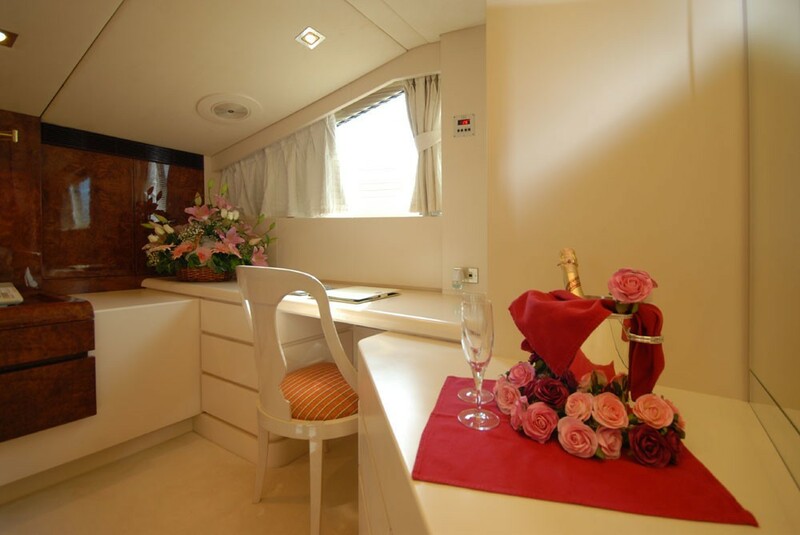 -high speed internet through out, the mobile phone network when in range, otherwise internet access via Fleet 77, wireless network (WiFi) all over boat. 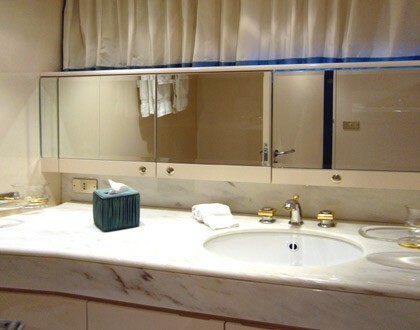 So it is possible to connect any laptop by wireless connection. 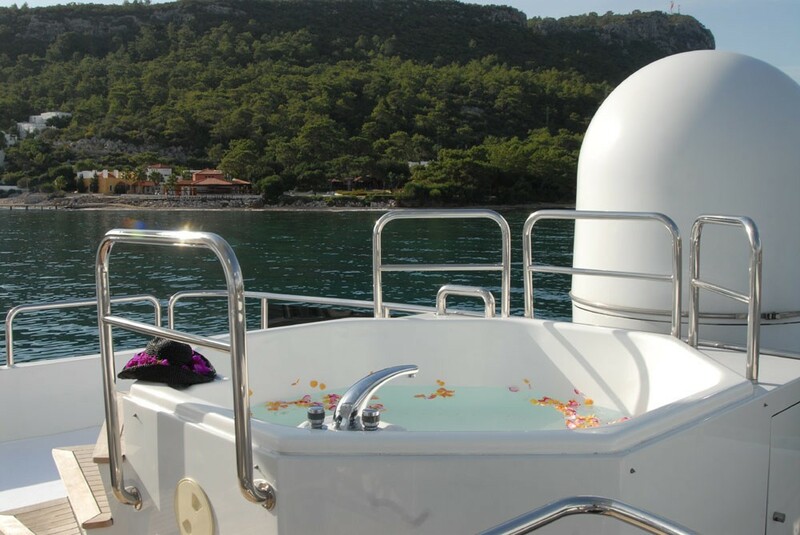 In marinas or near the shore where mobile phones work, we connect to Internet via GPRS modem or External WiFi (if available), in both cases Internet will be free of charge for the client. 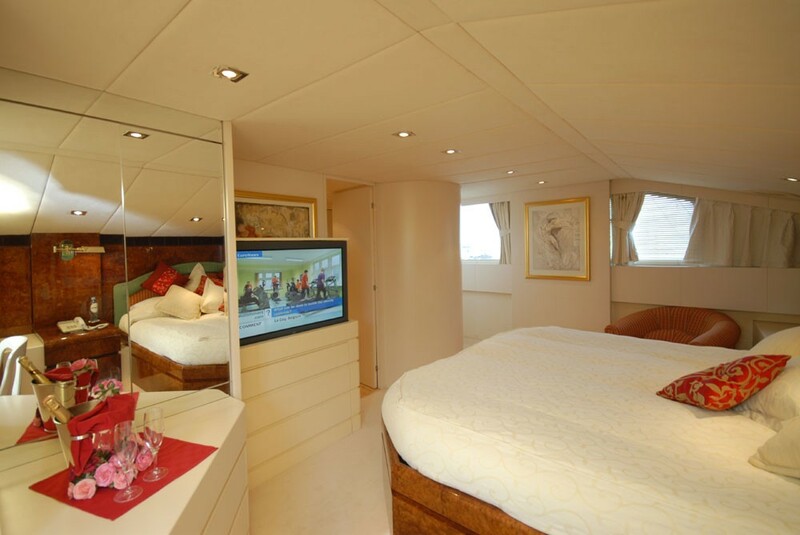 At sea LADYSHIP can still go to Internet via Satellite.